Have you ever had one of those days where you wake up in an awful mood and act like an absolute monster? I did. Saturday. Saturday was pretty bad. I was having a really off day, not feeling like myself, and overwhelmed by things that shouldn't have been so overwhelming. Nothing was working out and I was just getting annoyed of anything and everything around me. Poor Reuben had to experience my raging bitchfest firsthand. But we survived - he still likes me somehow. Sunday came, we went to an NFL fantasy draft, and I ate fried cheese curds for the first time which immediately fixed all my emotional problems. Omgosh they are so good. Oh, and I got gelato... problems gone. This happens to everyone, right? Or am I that extra sensitive kid in class? It feels like there is a tidal wave of emotions hitting me all at once and all I can do is wait for it to pass. In between my fits of frustration and tears, I self medicated by watching Parenthood on Netflix and making myself a cozy hot bowl of instant noodles. Can I talk abut Parenthood for a hot second before I get to the noods? I'm obviously very late to the Parenthood train. It encompasses everything I love: family, weekly family dinners at a long table, love, cute Berkeley/California homes, and learning important life lessons. This show was made for me. I mean, in the last episode I watched, Crosby and Jasmine got married in the magical backyard with a gospel choir singing "make you feel my love". MADE. FOR. ME. I was obviously crying my eyes out. Then the episode ended and I realized I needed to eat. My mom made us a lot of instant noodles growing up. They were quick, comforting, and cheap. She would always add a crispy egg. It's essential! Then she would either cook up some veggies or fry up some ham or spam to add into the mix. In my mind, instant noodles were a treat and not something you were forced to eat because you're a poor college student spending all your money on bass wood and black clothes. 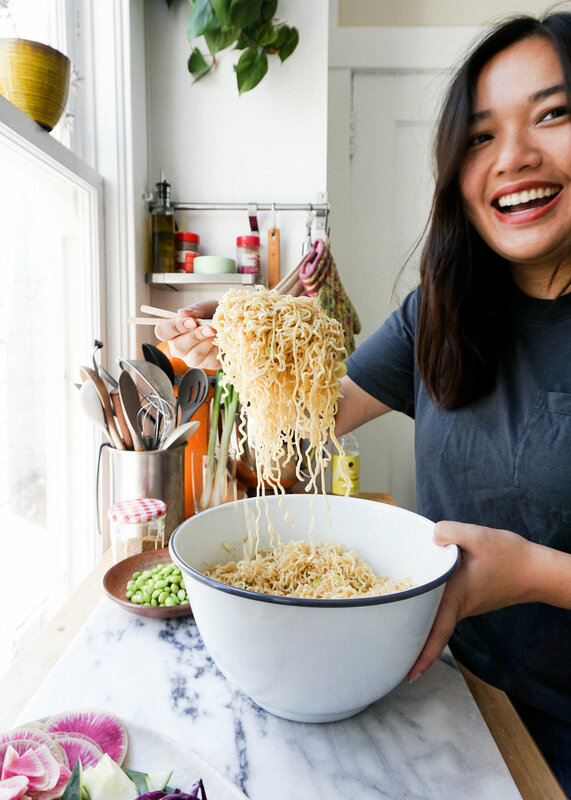 I did eat a lot of instant noodles during college, but the overachiever in me always had to upgrade it like my mom taught me. It was the perfect thing to have after I came home from studio late at night or if I woke up a little hungover from dancing until my calves ached in the Brotel. So this Saturday, in the midst of my raging bitchfest, I was hungry and upset and saw that there was one package of instant noodles sitting in the way way back of cupboard. It was exactly what I needed. I continued to be pissy for the rest of the day, but it definitely helped. 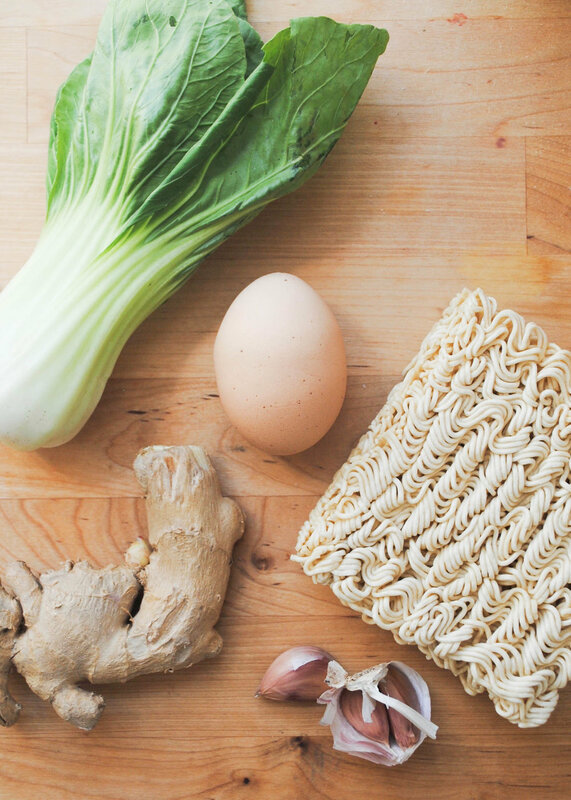 Here are some key tips to follow if you want to upgrade your instant noodles. 1. Only use half of the flavor packet. You don't need all that sodium! 2. Put an egg on it! Fry it, poach it, soft-boil it, swirl it into the soup egg drop style. 3. Cook a veggie. Bok choy, carrots, spinach, mushrooms, kale, whatever you have on hand will work. 4. Add a punch of flavor. Grate in some ginger or garlic. Add in a few drops of sesame oil, Sriracha, or dark soy. 5. 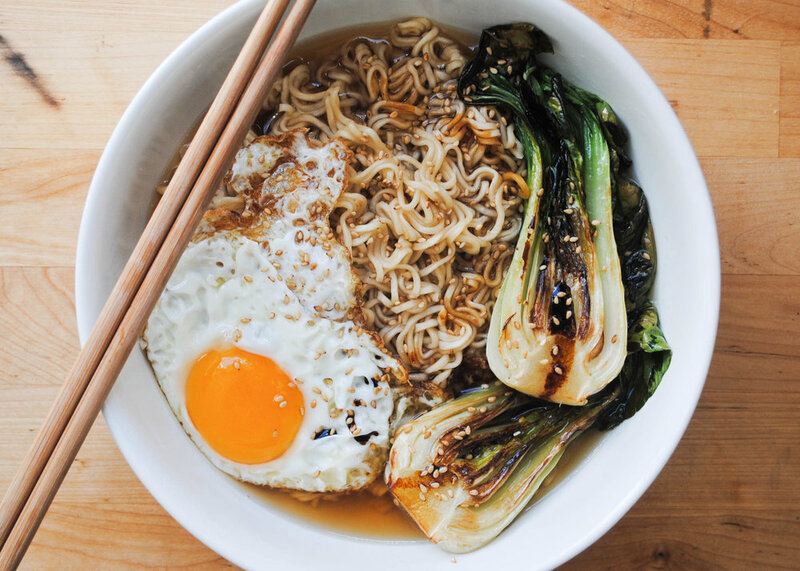 Explore the instant noodle section! You can get instant pho, laksa, udon, soba, green noodles? Literally so many options. I love going in that aisle and picking out a few new ones to try. Some of them are legit. Stock up on some instant noodles, so that the next time you turn into a monster you'll have something tasty and easy to have for lunch. Have a great rest of week! Stay cheery! 1. Bring pot of water to a boil. Add half of flavor packet and grate in ginger and garlic. Once soup starts to boil, turn off the heat and add noodles to the soup. Allow to cook in the hot water for 3-4 minutes, until al dente. 2. Sear bok choy in pan with olive oil, salt, and pepper, about 5 minutes. 3. Fry egg in olive oil until set and crispy, about 2 minutes. 4. Assemble your bowl and enjoy!